Various members of RHCP have recently been commenting on the release of the new Red Hot Chili Peppers’ album and the associated tour. This is an update & summary of everything that’s been said recently so far. 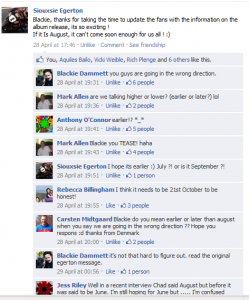 Blackie Dammet made a ‘cryptic’ post on Facebook when a fan commented on the album release date; people are debating still whether he meant the album will be released before or after August! He also went onto say that there is still no announced name for the album. Anthony Kiedis had mentioned the working title for the record to be ‘Dr Johnny Skinzs Disproportionately Rambunctious Polar Express Machine Head‘ (more information e.g. original interview in the link); it was a joke title based on a friend’s comment and in the original interview, Kiedis clearly stated that this was not the final title for the album; nevertheless, this did not stop some media sites wrongly printing articles that ‘Dr Johnny Skinzs Disproportionately Rambunctious Polar Express Machine Head’ was in fact, the new RHCP album’s name. Blackie Dammett has further qualified that ‘Dr Johnny Skinz’ was definitely a joke. 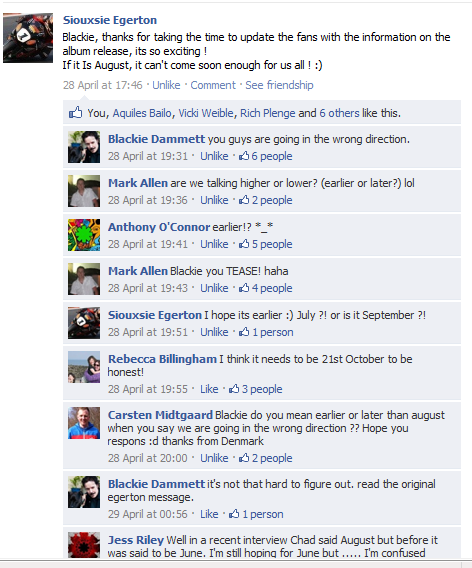 Other countries have been named by Blackie Dammett in various posts on his Facebook page and his latest update is that RHCP tour dates are still being confirmed but that the tour will be massive! 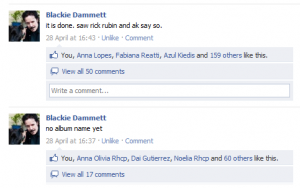 For anyone interested: The Facebook RHCP Tour page mentioned is one I set up to help out Blackie Dammett as he was being swamped with information requests; I’ve added other RHCP website admins to the group so we can try and get as much information as we can, as quickly as we can. This entry was posted in Anthony Kiedis, Chad Smith, Flea, New album, New Tour 2010, Red Hot Chili Peppers, RHCP General, RHCP Tour 2011 by Squitherwitch. Bookmark the permalink.